Hello again. 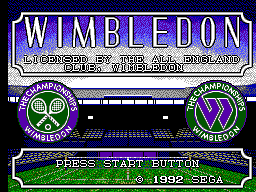 This time around I'm reviewing this little gem of a game, Wimbledon. With a license from one of the world's biggest Grand Slam tennis tournaments, this tennis game probably sounds more appealing than others. I first came across it in my childhood and loved back then as much as I do now. 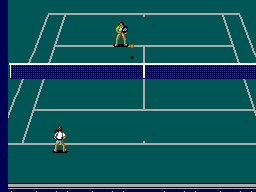 I even learned the rules and scoring of Tennis thanks to this game. Anyway, let’s continue. Basically, it's a tennis game, with a full court view with the players on the top and bottom of the screen (better than the birds-eye view in 'Tennis Ace' I'd say). For those of you who know how tennis is played, it's pretty straight-forward. For those of you who don't, you'll pick it up quick. It plays at fast and heart-racing rate which can make the game really exciting, probably one of its biggest pro's. Like real tennis, you can pull off all the shots; forehands, backhands, volleys, lobs, smashes, you name it. You have several modes to choose from: Free Match Mode, for playing one-off singles or doubles matches (great fun with another player); Tour Mode, for creating your own player (you can name him 'Federer' and pretend you're really him, magical!) 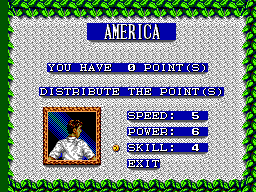 and you have to make your way through the 4 tennis Grand Slam tournaments and build up your stats. At first it may seem hard but once you've maxed out your player’s stats then it really becomes fun. It also uses a password system as a save method. The sound effects are great and never become annoying. Although the lob shot sounds a bit odd, it's a good way to make it distinct from a normal groundstroke shot. The crowd cheering and clapping also makes for a good atmosphere. During the matches there is background music, one for each different court type I believe. They're all upbeat and make the game more interesting. They're pretty memorable, but for players who might get annoyed with it will not have the option to turn it off unfortunately. The controls are simple. Move around with the D-Pad, Button 1 for groundstroke, volley, smash and dive shot and Button 2 for lob. Depending on your players and the balls position depends on what kind of shot is player when button 1 is pressed. If it's high in the air it will be smashed and if you are not close enough to the ball to perform a regular ground stroke a dive-shot will be produced. The direction of the ball is determined by the direction of the D-Pad when you hit the ball. The controls don't long to get use to and are very responsive. You have to like tennis to really appreciate the game and give it a good go. But when you do you'll be hooked. Making your way through the tour mode and building up stats and playing in nail-biting matches are great fun and you'll probably be playing until your players stats are maxed out and you become a god. Once you've destroyed everyone twice over you might stop then. I can't get enough of this game. Overall, it’s a fantastic game. The complex sport of tennis has really been simplified and made enjoyable by this game. I suppose you have to like tennis to really enjoy it, but nevertheless it's still very pick-up-and-playable (is that a word?). It's super fast and addictive and is undoubtedly the best tennis game available for the SMS. It may seem too hard or fast the first time you play, but give it a chance and you'll learn to love it. Definitely one worth owning and it can be picked up pretty cheap too.